Ear Training One Note™ Complete contains without question the most important exercises you can do to improve your ear training skills. We could dazzle you with a stream of quotes about how great this method is but that is not our style. This ear training works, go ask anyone on our Facebook Ear Training Page. You will get your answer right away! Most of you are here on this page because you have found that other ear training courses didn’t work. This is not surprising; I had the same problem and wasted years of my life learning “interval based” ear training. I found out that it didn’t work for me either. Then I discovered and perfected the techniques in this course. You should start with Ear Training One Note™ Complete and Contextual Ear Training. Those are the two courses that get you listening and singing. Not much of a singer? Don’t worry, the singing is just to get you to hear a note in your head and then prove that you hear it by singing it. It’s that simple. You don’t need a great voice, but you have to connect with your inner voice. One of the most common mistakes students make is to go to some free ear training site with no guidance and start hacking away at the exercises. I needed guidance as do all of us when working on ear training. Don’t figure you can do this on your own, because the chances are you can’t. I know that what I thought was the right approach to ear training was totally off base when it comes to many of the steps to develop great ear training skills. That’s why I’m here to answer your questions via email. Don’t be shy and don’t think you can figure it out. Practice time is too precious! Ask for help, it’s free, so the price is right and I do actually care about your development. Again, ask anyone of the Ear Training Facebook page about interactions with me via email. Save yourself the heartbreak of doing an exercise wrong for years and wasting time. Ask me, I’ll put you on the right path. I recommend that you buy the digital version and put these exercises on your smart phone. That way you can do these exercises anywhere, and multiple times throughout the day. We make the physical version available for those of you who still like to listen to a CD. But honestly you need to randomize these exercises and while the CDs can be randomly chosen, you will start to memorize the order over time. With itunes and other software you can really shuffle your files and always have a random list. Also everywhere you go you take your phone right? Well now you want to revolutionize your life by adding in some ear training at any of those down moments throughout the day that you have a few minutes. This works! This ear training is all about memory, so doing it many times throughout the day is the ticket! A Complete Transformation of Your Musical Perception with this Ear Training One Note™ Method. Both my own and my students’ abilities have been transformed by this ear training method. This develops the way you actually hear music. So as you learn with this method you will see that your ability to play music will improve dramatically. Will it happen over night? Probably not. Will you get frustrated? Oh yes! Am I here to help when you want to throw the exercises out the window? Yes! Relating sound to a key center is what this entire ear training method is about. If you are just becoming aware of this idea of “hearing within a key center” let’s look at a little history of ear training for musicians. The “Interval” method of Ear Training has been taught in music schools for literally hundreds of years and rarely been questioned. This method is based on hearing the distance between each note with no regard to a key center. But if you are only using intervals for ear training you will develop a host of problems. There is a detailed discussion of “interval” vs. “key center” ear training in the book that accompanies all our entry level ear training books. Make sure to read this and our FAQs to understand all different aspects of ear training. It is also recommended that you read our sister website practice ear training which is totally dedicated to your understanding of our ear training method. The Essence of this “Key Center” Method. Ear Training One Note™ Series teaches you the “Key Center” process. I know that working with the audio files in the Ear Training One Note ™Series over time, you will be able to recognize the sound of all 12 notes with a “key center.” For some students this will be a quick and painless rebooting of the way they hear sound; for others it can be a frustrating path with many possible pitfalls. Ear Training One Note™ is a Three Pronged Process. You need to work on identifying sound as you hear it from an external source, as well as how you hear it in your head when you are improvising or composing. The third component is “Direct Application.” “Direct Application” is working with various course to apply your new ear training skills to real music. You aren’t going to magically do any ear training an instantly be able to apply it to real music. You need a graduated process where you reach a certain level then apply your skills to real music. With this in mind we have created a whole series of books that develop these three aspects of ear training. They basically boil down to listening, singing and “Direct Application” exercises. Listening exercises teach you to identify the sounds from external sources such as another band member or a song that you are hearing on your MP3 player. Singing exercises help you identify the sounds you hear inside yourself when you are singing, improvising or composing. You need both sides of ear training to become a great musician. The good news is they complement each other so the more you work on one, the more it will the help the other. The Different Ear Training One Note Books that are Available. Because musicians are coming to this ear training with so many diverse backgrounds and abilities, over the years we have created a lot of different books to help them get the method that is most beneficial given their history and current ability. If you would prefer to buy the Ear Training One Note™ Method divided by level: Beginning, Intermediate and Advanced, please visit our Other Ear Training One Note™ Products. You will also find super advanced one note levels and One Note with “Degree” answers on the Other Ear Training One Note™ Products That said the last thing you want to do is buy a version of this ear training without a book to explain what to do. Don’t figure you are going to save 5 bucks and figure it out yourself. That is a very unwise move, especially when just starting this method. Get the book and read it. Contact me with questions, Find out the best way to practice to improve at your quickest pace. Get involved so that we can head off misunderstandings and misconceptions. 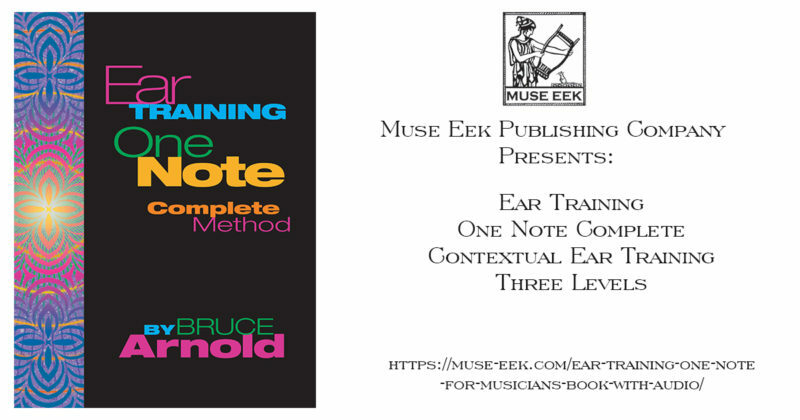 The Ear Training One Note™ Books are available without a book because Muse Eek has other outlets that just sell the book without the audio files. You then need to buy the audio files on this website to complete the course. Our Most Common Recommendation for Ear Training One Note™. Because “key center” based ear training can be a completely new idea to even advanced musicians, we always feel that the best idea is to start from the beginning so that no crucial details or concepts are overlooked. The most common problem we have is from musicians who “think” they have more advanced ear training skills than they actually have. Another common issue is a student thinking that knowing about ear training one note™ is the same as having the ability to simply hear that way. No, it does not. Our Experience with Ear Training One Note™. It is also common for students to start at one level and realize they need to go to a higher or lower level. Based on these years of experience we have tried to create a path through our ear training method that takes all of this into consideration. Unfortunately, even with all the resources available, it is still possible for students to make mistakes. This is why it’s important to stay in touch with me throughout your ear training journey. There are many websites and apps out there they may do some similar things. But all you need to do is make one mistake in your perception, and you can be wasting years practicing the wrong way. Let’s first talk about how you will be doing this ear training. We have found that the best way to do this ear training is with an MP3 player. It allows for many more ways to organize the audio files and is very portable. We do offer physical books and CDs with with some of our ear training products. But we HIGHLY recommend you not take this path with our ear training method. It is cumbersome and restricts the way you can set aside practice time. Listening and Singing: the two crucial aspects of Ear Training one note™. We usually recommend a listening and a singing book to begin you Ear Training one note™ studies. These two books are Ear Training One Note™ Complete and Contextual Ear Training. We recommend Ear Training One Note™ Complete because it contains three levels of exercises: Beginning, Intermediate and Advanced. This ensures that you can find the appropriate level to start on without having to re-purchase another book if the one you bought is too easy or too hard. Please keep in mind that you may be an advanced musician but have severe ear training problems or a beginning student with excellent aural skills. This is why we recommend the Complete version. You move from one level to another as you get 80% correct answers. All three levels give you the same exercises. Each level doubles the speed of the exercise thereby making it twice as difficult. So this makes your response to music that much faster until it is a natural reflex. 36 pages with 3 CDs of audio files with physical version and 3 CDs in MP3 format with digital version. Some students can fly through this ear training with no problem. But many musicians need some help. Knowing this, Mr. Arnold offers email support for students as they work through this process. So rest assured as you enter this ear training method that you are not alone. You can get expert help if you run into problems. You can also join our ear training facebook group to interact with other students. This method has been helping musicians for almost 20 years now. It’s one of the best selling methods Ear Training systems on the market. Simply put: It is successful because it works! BUT the secret weapon is Bruce Arnold. He is only an email way to help you. Whether you are a beginning or an advanced student seeking to perfect your skills. You can call on Bruce to help you through this process by contacting him via email. The reason why dedicating a short amount of time each day will be all you need to improve. Literally 5 to 10 minutes 5 to 10 times a day will be all it takes to master this ear training one note™. Mr. Arnold’s Blog on ear training and other musical topics can be very useful to learn about ear training and other topics related to music and guitar playing. Tone Deaf and why you most likely don’t have this condition. 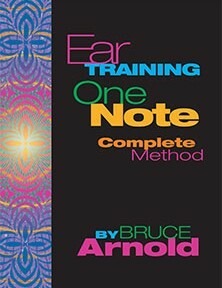 This entry was posted in Ear Training and tagged contextual ear training, ear training one note complete, aural comprehension, aural skills, ear training exercise, ear training, key center, ear training one note™ by Bruce Arnold. Bookmark the permalink.